In the introductory post on iOS CI Olympics, we have selected the few player and few games for this competition. We will be evaluating the player one by one on the basis of their performance in the each game. In this article, the player is TravisCI, a pioneer in providing free continuous integration to open-source projects. The Travis is made up for Github, if you got Github account then registering up with Travis is so easy. Just use your Github credentials and you are inside the Travis. Like other CI servers, Travis won’t setup project by himself. There are the couple of steps we have to perform to get going. We need to sync the GitHub project and enable the repo to build on TravisCI. We also need to add .travis.yml file to the root of our project. Travis will guide you to complete the project setup. language: objective-c osx_image: xcode9 script: - echo "Hello Travis"
Once, code is pushed to the Github repo then my project started building on Travis. Now that, I have scripted what I would like to run. The Travis will take care of executing the builds from now. Medal: Travis has earned the Gold medal for the default build configuration game. As soon as, we push the commit to Github repo, Travis will trigger the build. We can configure the builds for branches or pull requests. The Travis will boot brand new VM, check out the source code and execute the configure scripts. The booting of the VM may take some time to start the actual build, so the build will be bit slower but as soon as build started the execution process is very smooth. Travis log shows the details of the every step and collapses it when the step is executed, this reduces the log noise. The above logs show that how Travis has executed all the steps that we configured for the XCFit project. Travis doesn’t keep the build artefacts for the build, we need to upload the artefacts to some other services like AWS S3 bucket or Artefactory or similar. Travis will kill the VM once the build has been finished. The Travis has nothing other than xcpretty–travis-formatter to display the test results in the build logs. Unfortunately, we can’t get better test reporting with Travis. Medal: Travis has earned Bronze medal for Real Device Testing game. The build settings in the Travis are very limited which includes turning of branch buildings, cancelling redundant builds and setting up environmental variables. The environmental variables are pretty common in the Continuous Integration system, Travis has an ability to define the environmental variables with its values that can be used while building. The user can define own environmental variables on top of Travis default environmental variables. Medal: Travis has earned Silver medal for Build Customisation game. Travis has a cool feature that allows us to define the matrix to be run in the parallel. This feature is called Build Matrix. We can define the steps to run in parallel. e.g If we want to run the test in different simulators then we can define the matrix with the name of simulators or iOS versions as environment variables. The builds will run in the parallel without taking extra time. The Travis can also give us concurrency but it involves cost. Travis can go upto 10 concurrent builds as per their pricing plan. Medal: Travis has earned the Gold medal for Parallelisation and Concurrent Builds game. I wrote the detailed article on Travis build stages here explaining its pros and cons. This feature looks awesome. Medal: Travis has earned the Silver medal for Build Pipelining game. 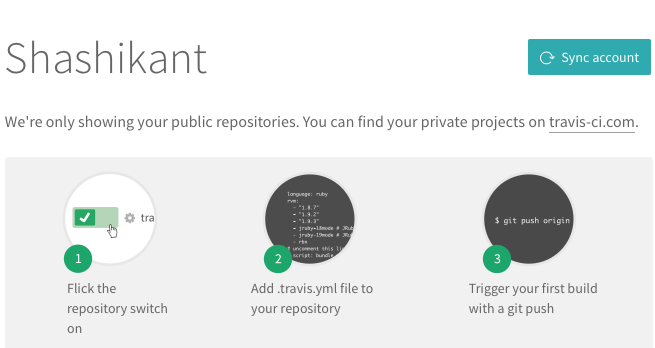 TravisCI is designed to work as an Infrastructure as Code. The whole build pipeline has to be coded in the .travis.yml file. There is very minimum UI configuration for the build allowing us to reduce human errors. There are code changes required to change the build configuration. Medal: Travis has earned the Gold medal for Infrastructure as Code game. Medal: Travis has earned Gold medal forDirectory Caching game. Travis doesn’t have any inbuilt support for the code signing of the iOS apps. The user has to script all the required steps from adding distribution certificate to keychain till uploading a binary to iTunes connects. This requires strong scripting skills. This blog post explains most of the areas to automate iOS deployments on Travis. Medal: The areas that I haven’t fully tested with XCFit projects, I will be giving the Silver medals by default untested but available features. Travis has no official third-party support for any service. However, we can use custom scripts to integrate Travis with other services. e.g deploying a build to Fabric. There might some cases where Xcode image of Travis has some pre-installed tools. Medal: Travis has earned the Bronze medal for Third Party Integrations game. 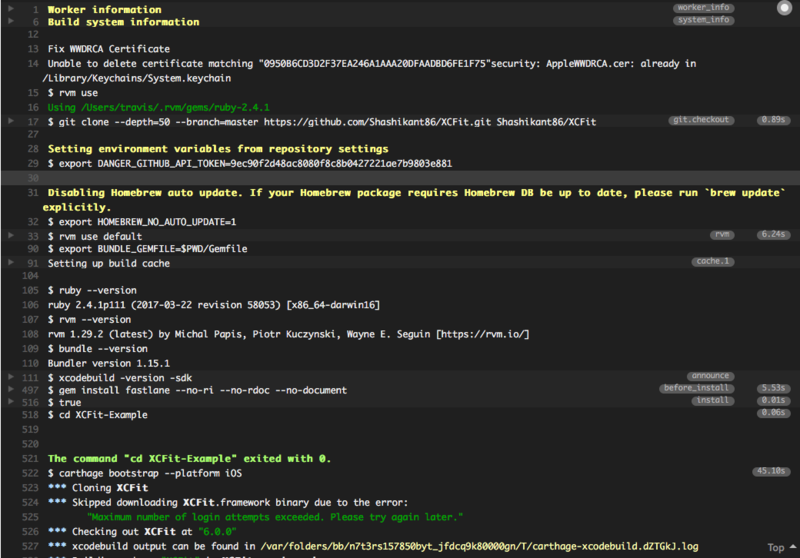 TravisCI boots fresh VM for the new build. The process of booting, checking out the source code and installing pre-defined software can take a long time. The actual build will start once all the setup has been some. Travis builds are bit slow. 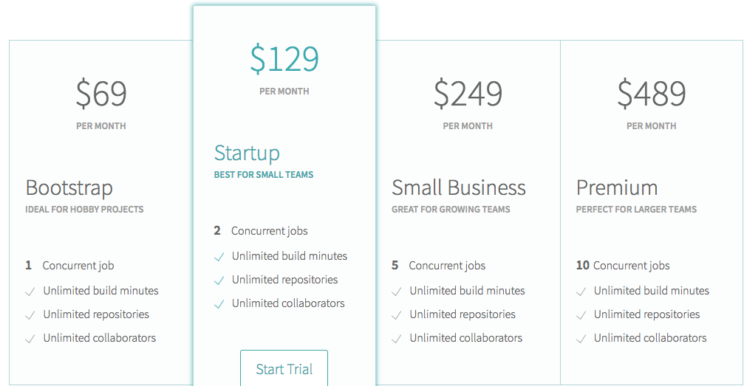 It might be great for the paid version but open-source version takes a bit of time to finish the build. Medal: Travis has earned the Silver medal for speed. Travis has an option to store all the secret in the form of an environmental variable that can be accessed from the settings page of the Travis build. We can inject the access tokens, encryption keys and all sort of sensitive information here. Travis will store then and won’t print as part of build execution. Medal: Travis has earned the Gold medal for Secret Store game. Travis is usually fast in upgrading the Xcode images and other developer tools. Travis has blogs to let the users know that new images are available to use. In case of Xcode9 Tarvis has that images since beta 1. Medal: Travis has earned the Gold medal for fast Upgrades of Apple developer tools. Travis is one of the pioneers CI service who is serving the open-source community since long. As mentioned earlier, there are 900K open-source projects and 600K users are using Travis for their open-source projects. The numbers tell the popularity of the Travis. Medal: Travis has earned the Gold medal for Open-Source Project Support. Travis doesn’t configure the build by himself. The user has to script all the build requirements in the config file. There is a little bit of learning curve when we get going but once learned its fun. The user needs to learn the scripting Travis features and integration to the third party but it gives all the power to the user. Medal: Travis has earned the Silver medal for Learning Curve. Travis has amazing user documentation which guides the user from getting started to configuring complex builds. There is all sort of information with example code. Travis also showed how to use third-party tools with Travis in the documentation. Travis runs a blog to keep users updated with the latest changes in the infrastructure. Travis has the status page to update users if there are any known issues. Medal: Travis has earned the Gold medal for Documentation and Support. Travis also has clean and intuitive UI that helps users to set up the projects easily and without any pain. The features are easy to discover with the clean UI. Medal: Travis has earned the Gold medal for Clean UI/UX. The Travis has enterprise plan which gives us 10 concurrent builds. Medal: Travis te deserves the Gold medal for the price game. As of now, we have seen the features of the TravisCI in brief, now the time is to decide what’s good and not good with TravisCI. There are certainly some great features that TravisCI offers but there are some limitations as well. Travis has an excellent web interface. The new features of Travis like build Matric and build stages are very promising. Steep learning curve for the new users. The Travis build logs executed for the XCFit project are available here.